IPOPI was saddened to learn that Sara LeBien passed away on January 14, 2018. Sara passed away after a long battle with a rare neurological disease, at her home, surrounded by her husband Bob, son Mark and daughter-in-law Lori. 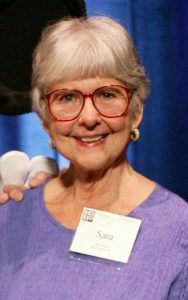 Sara was the wife of Bob LeBien, one of IPOPI’s founders and IPOPI’s Honorary President and a dedicated member of the primary immunodeficiencies community. Sara and Bob dedicated much of their life to improving the diagnosis and treatment of people with primary immunodeficiency diseases, primarily by fostering the creation of patient groups, the Immune Deficiency Foundation (IDF, US) and IPOPI, after their son Mike was diagnosed with a PID. The IPOPI LeBien Award was created in recognition of the LeBien family’s invaluable contribution to the global PID community. Sara was born in 1933, in Indiana, US, and throughout her life, was a primary school teacher, a docent and a tutor, having been involved in multiple schooling projects. She did volunteer work at schools, museums, churches, Meals on Wheels, the 1984 Summer Olympics, for the Los Angeles Native American Center and of course for the PID community. Sara wrote an illustrated booklet, Our Immune System, which was published by IDF and has been translated into more than a dozen languages and distributed around the world. Sara is survived by her husband, Bob, her son Mark, two daughters in law and five grandchildren.